The above picture is of a recent Iron door install in Santa Monica, CA. 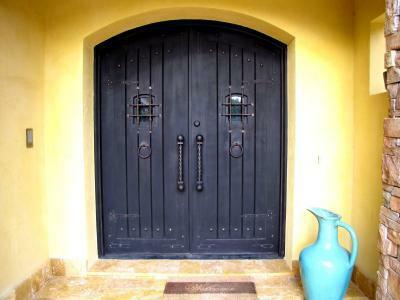 This spanish style villa was was in need of a little more character and this iron entry door was a perfect match. These doors are Spanish inspired and added the perfect touch to this home. Besides the fact that these iron entry doors make a beautiful decorative centerpiece, they provide security and the confidense that you and your family will be able to safely sleep at night. This beautiful Iron door is long lasting and durable and a sound investment for your home. We can also provide your home with numerous other options to custom match your front door such as iron garage doors, Iron windows, and iron gates and railing We invite you to explore our website and contact us to speak to a representative. Let us show you how Signature Iron Doors can give your home the elegance and character you derserve.